When we look at garden design, ideas for water features can be be fairly standard. Innovative designs for fountains and outdoor water features can act inspiration. And yes you can build your own rock or stone water feature. One of the most natural elements that can be included in any garden is a water feature. Visually attractive, soothing and it also attracts birds to the garden. 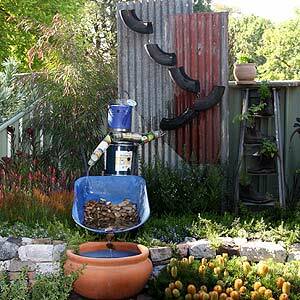 Water features are certainly not a new idea in garden design, and we look at some new, classic and 'recycled' ideas that you might like to incorporate into your garden design. Gardeners and landscapers are always looking for new Water Feature ideas for the garden. In general designs include Stone, Solar powered, Contemporary Designs and Classic water features. So where do we start when deciding on a water feature idea, its all to do with overall garden design, the water part is to complement the garden. In the UK indoor and outdoor garden water features are now a popular addition to gardens, homes and courtyards. 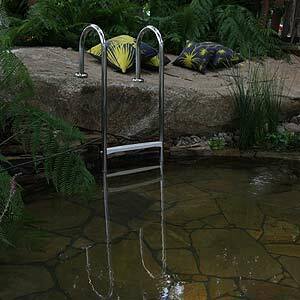 Fountains, ponds and garden streams add a sense of calmness to any garden, with water features, ponds and fountains now available in a range of materials including: solar water features, stone water features copper water features and stainless steel. Architects are now incorporating water feature concepts as a way of connecting the indoor to the outdoor, and this idea is prominent in many new designs. A well designed water feature to fit any garden situation. Without doubt contemporary water features and courtyard water features designed for the garden are the most popular new additions to the UK landscape. Many gardeners are now looking at new japanese influenced water features along with pool and stone water feature ideas and designs as a means of adding interest to the garden and outdoor area. The use of solar powered water features in the garden is increasingly popular, easy to install and low running costs are both very attractive fea tures. Wall mounted water features are also a great addition to the courtyard garden or indeed on any outdoor wall, an increasingly popular item, these may be custom made, or purchased 'of the shelf'. Self contained solar water features are now increasingly	popular, they are becoming a 'DIY' water feature due to the ease of installation in many gardening situations where power is not readily available. And of course a plunge pool or swimming pool can be a feature in the garden as well. How about a pool surrounded by natural rock and ferns, in the winter its a water feature, in summer its a pool. And it looks great all year round. For Japanese style water features, try bamboo, stone troughs and rocks. Or maybe a Shishi Odoshi, a bamboo deer scarer that works with running water. Stainless steel water features are easy to clean and add a modern architectural look to the courtyard. Indoor water features are fantastic, they can be installed in a foyer or atrium and add an exotic sense to any home or business. 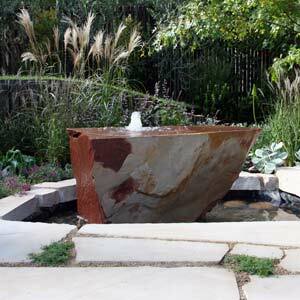 Slate or stone water features are very stylish and look great when connected to garden ponds.